Choose a right Magento 2 Affiliate for your store. Our Magento 2 Affiliate extension is a collection of all M2 Affiliate module in the marketplace. Everybody knows one customer is a priceless asset the seller get and that is an enormous treasure if you explore correctly. Magento 2 Affiliate extension, combined well between Magento platform and Affiliate marketing solution, will help you use anyone’s relationship regardless guests or existing customers in order to establish strong Affiliate network and create more and more amazing profits. Applying the reward rule “The more referrals, the more commissions” motivates the development of network dramatically. With Magento 2 Affiliate Extension, you can create unlimited Affiliate programs as you need while each campaign is assigned to exact Affiliate groups within time interval you set. At this time, the system will automatically enable the Affiliate program whose priority is higher. Thus, ensure that your Affiliate system still run smoothly without the disorder. 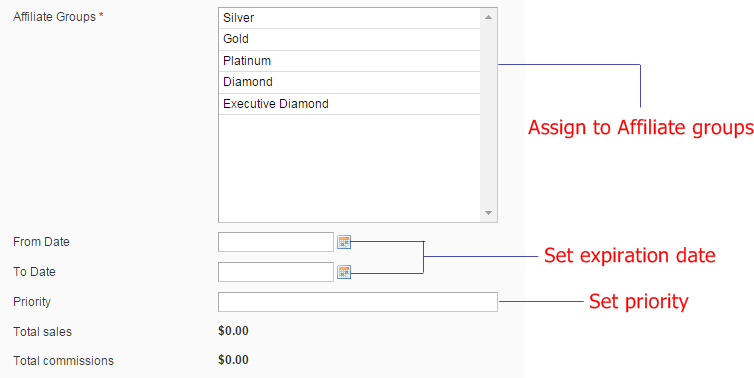 Despite multiple Affiliate programs, all of them will be under your control through name, start and end date, status and priority in Manager Campaign table. Affiliate marketing becomes the awesome solution to boost sales because its commissions principle by unlimited tiers. The higher you are, the more commissions you get. This is the motivation for your Affiliate network of development. Pay Per Sale is the basic payment method in order to give an Affiliate commissions when he makes profits for you. The commissions will be offered as fixed amount or percentage in the configuration and their value can be different on different Affiliate tiers. Pay Per Click is used for promotion banners. Commissions are only paid if a customer clicks on the banner and is navigated to your site. A number of clicks will be stored systematically on a statistic table in Affiliate account and admin’s report. A lead is approved when a visitor referred by Affiliate signs up a new account on your store or subscribes your newsletter. If Affiliate meets one of two conditions, he will receive commissions from you. This is a bit unique payment method from Magento 2 Affiliate extension. Affiliate will get commissions only when he reach exact number impression of a banner. For example: Get $20 for 200 impressions of the banner. Affiliate Banner and Affiliate Link are two available marketing materials so that Affiliate can use them to refer and earn more and more commissions easily. There are 4 types of banners Affiliate can design: text, image, flash and CMS Static Block. With the given banner, Affiliate has rights to put it on everywhere on his website, blog or even his current social network. When a visitor clicks on it and is led to your site, the click is the successful one and saved to pay commissions for the Affiliate. 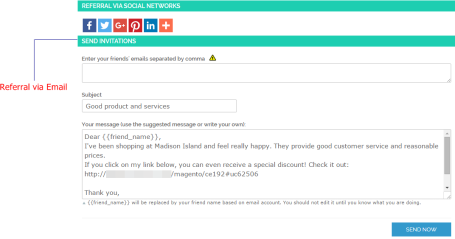 Affiliate module will use the referral Affiliate link and Affiliate code in order to send to friends. 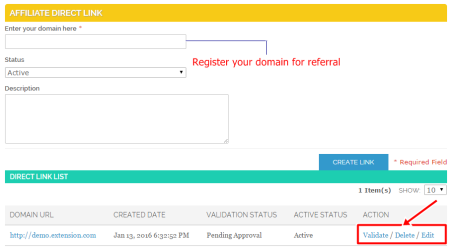 If the recipients carry out registration or placing an order via the referral tools, the Affiliate will be auto-added a responding amount of commissions. Especially, Magento 2 Affiliate Deep Links is easier and more effective when the extension provides Deep Links for Affiliate to refer friends. Deep Links allows customizing the patch of your original URL by instead of the complex link which is invited to Affiliate’s friends. For example: _gift_from_linda. Thanks to Smart Link function, each Affiliate can create separate referral link by himself. What about Direct Link? It is reserved for Affiliates who have the personal website. They can validate their domain on affiliate website, then every sale refer by that domain will be count as that affiliate. No refer link, code or email required. It is simple refer solution! On the other hands, social networks as Facebook, Twitter, LinkedIn,... and even email are ready for sharing. The Affiliate program becomes more exciting because commissions are allowed to withdraw cash. Depending on your configuration about minimum or maximum withdrawal amount, Affiliate will request the accordant number. 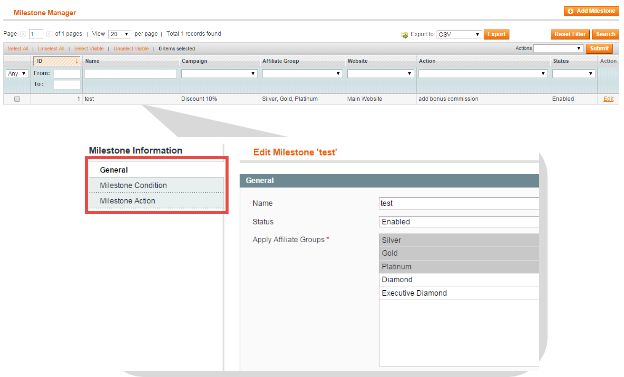 In Magento Admin, the management of Affiliate Withdrawal is easy and clear for you. Within withdrawal process, Affiliate will choose payment methods including PayPal, Bank transfer or Offline payment, etc. Depending on the chosen method, Affiliate must fill out the required information of payment method to finish the withdrawal. Allow you to create lifetime event as a number of orders, a number of sales, a number of commissions,... Affiliate who reaches the given conditions will be added bonus commissions or put into higher Affiliate group with many benefits. You can also automatically change their affiliate group to higher rank such as from Gold to Platinum, Platinum to Diamond. This is a great way to create an affiliate loyalty program as well encourages Affiliate network to work better and better. Magento 2 Affiliate widget is the small box you offer to Affiliates. It shows products you want to catch visitor’s eyes. More products are shown, more profits you get. With Affiliate store credit plugin, commissions Affiliate earned is stored in it. Therefore, the store credit is called as the electronic wallet of Affiliates on your store without any risk of losing money. In the wallet, Affiliate will track total earned commissions, total paid and balance amount for the next purchases. Affiliate report is the advanced plugin for any Magento store owners, which supplies necessary data so that you can analytics the effectiveness of Affiliate program you established. The report is shown in the certain time period from generally to specifically. Trash, the great tool from Mageplaza Affiliate Extension, is supported only in the backend when admin wants to clean unnecessary transactions and withdrawals. This site is not directly selling Magento 2 Affiliate. Get support, help please contact to the vendor.